I started with placemats I had found at Home Goods this past summer. I toyed with the idea of beginning with a white lace tablecloth, but I decided I liked the look of the dark wood of my table against the colors of the tablescape. I started with my white chargers from the Maryland China Co. 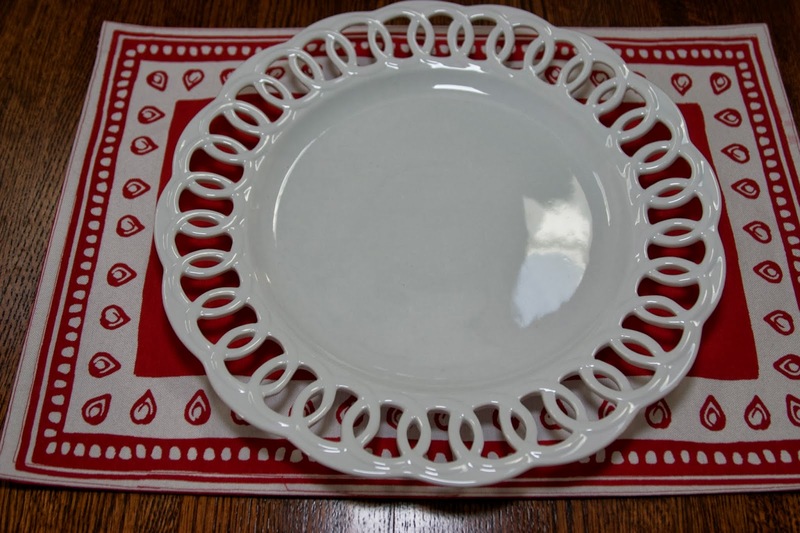 When I got to the fourth place setting, and hadn't yet found a red and white patterned plate to use, I was desperate. 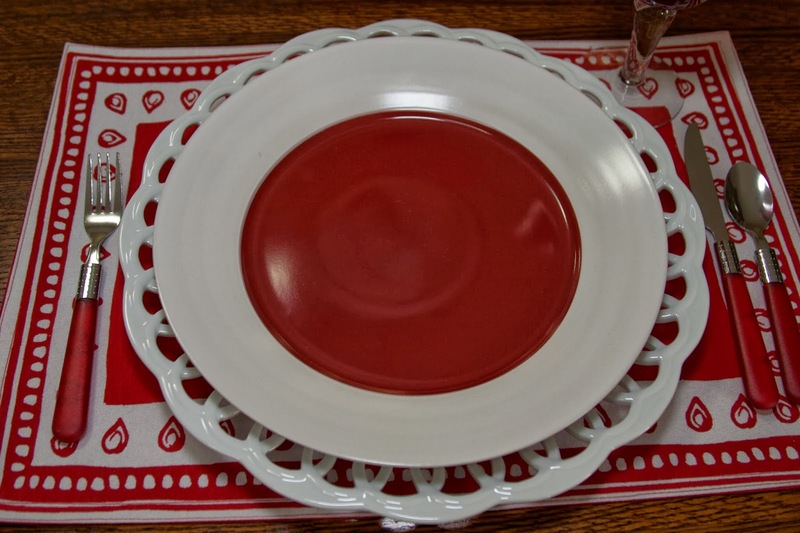 So, I confess to the following deception: I took one of my white Metaceramica plates from Home Goods, found ladybug stickers at Walmart and created my own red and white patterned plate! I share this with you in case you run into the frustration of not finding what you want, to create a "look". You might want to consider this compromise. I won't be using this table setting for a real meal, so there's no harm of anyone ingesting a labybug sticker! And as they say, "Necessity is the Mother of Invention!" Next came my Castleware (manufactured by Tabletops Lifestyles) plate from Home Goods. I wanted some texture on the dish stack, and I LOVE these plates for creating this. These heart-shaped ramekins from Michael's complete the stack. Here is the completed place setting. 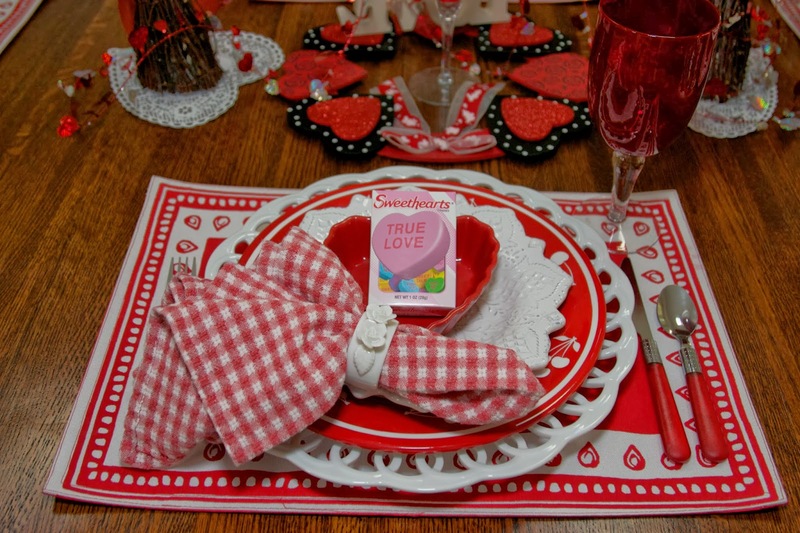 Hopefully, if this were for a real meal, the ramekins would be moved to the side of the place setting once the salad was served, and the conversation heart candies would be nibbled on AFTER the meal! I found the flatware at Walmart while I was looking for the ladybug stickers. The red goblets came from Home Goods. 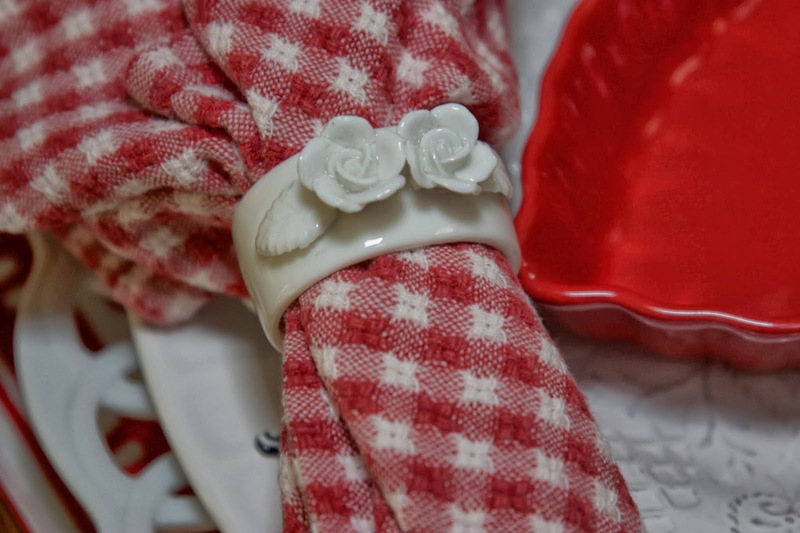 I've had the red and white gingham napkins for many years, but the porcelain napkin rings came from an antiquing adventure. I felt the white roses on these napkin rings would be quite suitable for a Valentine's table! The main component of the centerpiece is a Princess House glass chimney that was my Mom's. There were two, but, sadly, one was broken over the years. I love the delicate engraving on the globe. I've surrounded the candle holder with a wooden Valentine's wreath of red hearts, found at Hobby Lobby. 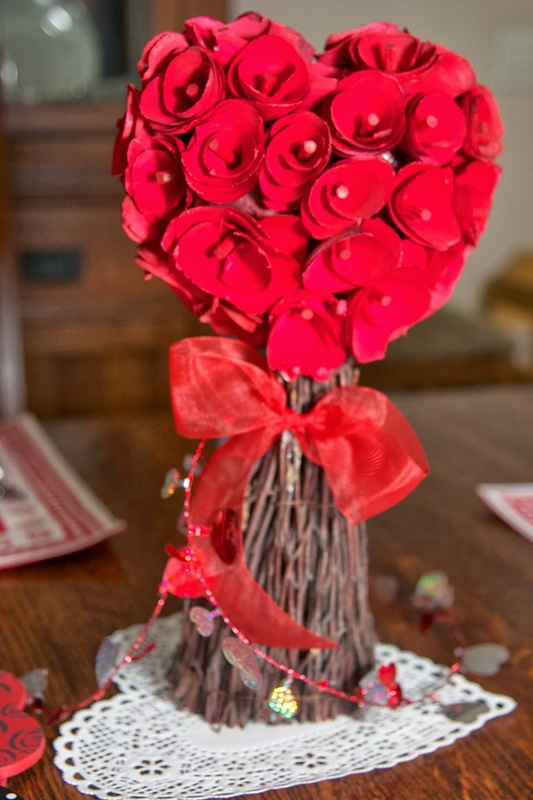 The red heart bouquets were unexpectedly found at the CVS pharmacy, along with the "LOVE" sign! One never knows where a pretty design element will present itself! I completed the centerpiece with a heart garland also from Hobby Lobby. 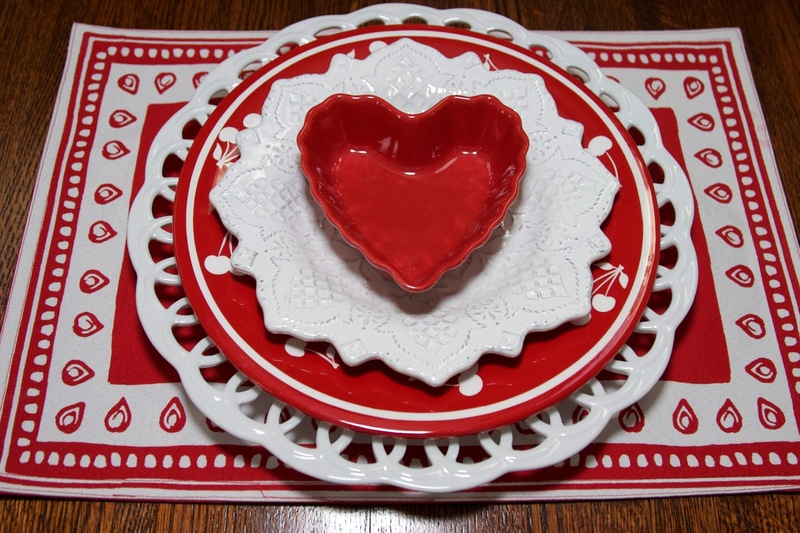 The accent piece is a heart-shaped dish I've had for many years from Home Goods. And what would Valentine's Day be without chocolate candy? I found the "kissing lips" placemat at Michael's. 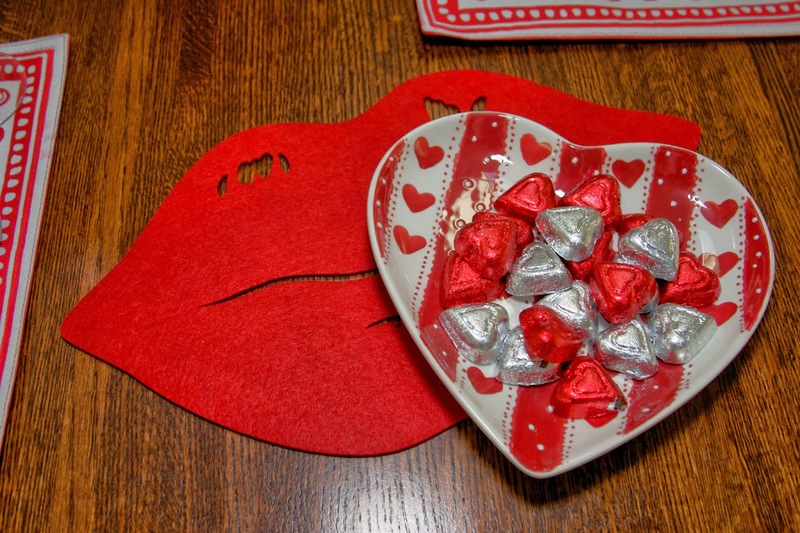 Afterall, what would Valentine's Day be without some kisses? Have a wonderful Valentine's Day, surrounded by those whom you love and who love you in return. May your day be filled with hearts, kisses and chocolate! 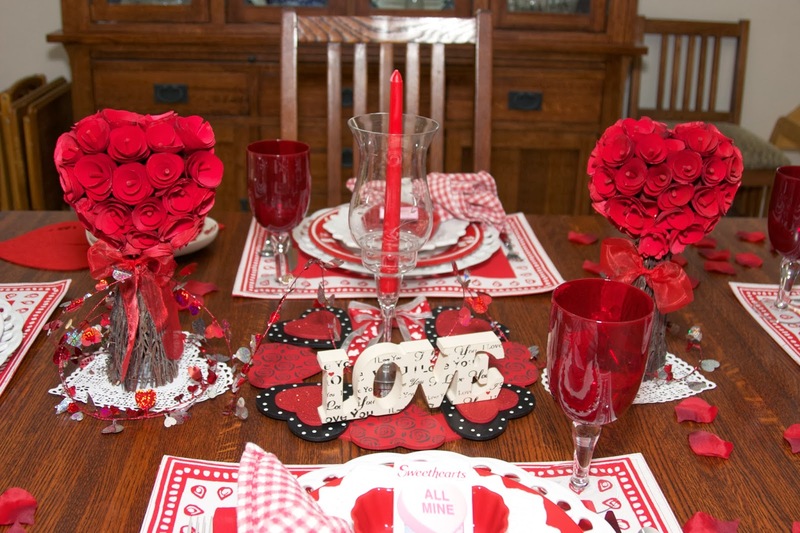 I'll be linking up to Laurie's Valentine Par-Tay at http://bargainhuntingwithlaurie.blogspot.com, Susan's Tablescape Thursday at www.betweennapsontheporch.net and Seasonal Sundays at http://thetablescaper.blogspot.com Be sure and visit these blogs and see all the pretty tables to be shared. Thank you Laurie and Susan and Alma for hosting!! I love reading your comments when you have time to stop by and share your thoughts!! If you'd like to become a follower and see posts as they are completed, please see the "Follow by Email" section at the beginning of my blog, add your email address and hit "Submit". 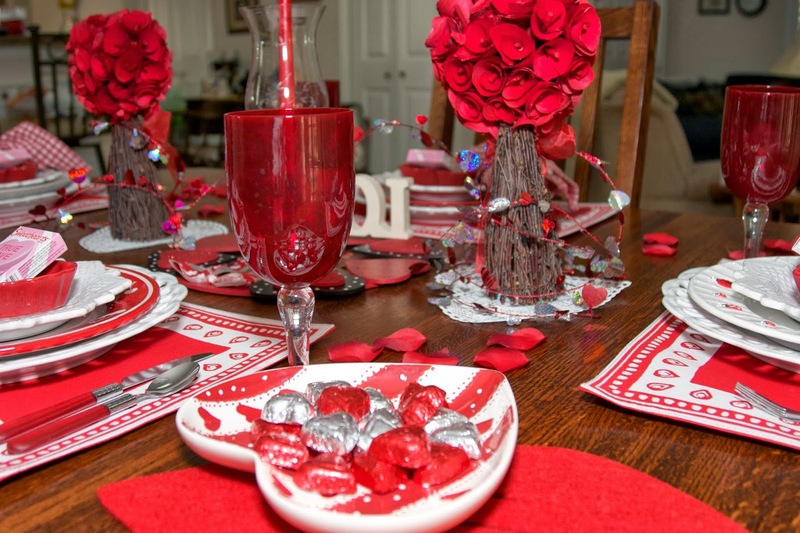 Rosie, this is such a fun and pretty Valentine table! I love the different dish stacks -- they add such interest. 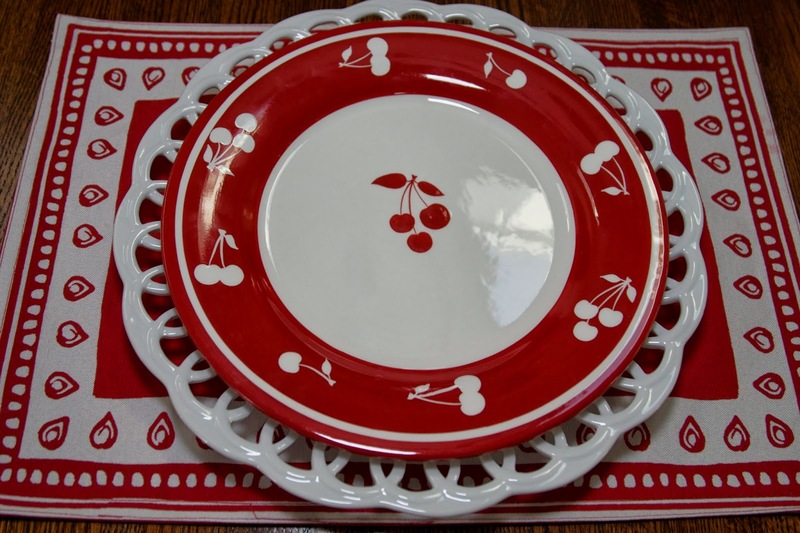 Now all of Blogland will be on the lookout for the darling cherry plates to complete your set! Thank you for explaining the origin of everything. I always like to know that! There is no doubt in my mind that you are an artist. This tablescape is absolutely Beautiful in every respect. I wish I had some cherry plates so you could complete your set.. I will keep my eyes open for you also. Thanks so much for your sweet comments on my Tablescape, and also have a wonderful Valentines Day with your family. Hi there, Rosie! This is my first visit to your blog. I coming over via Laurie's annual Valentine blog party. You have some really pretty pieces! Your chargers are great with that sort of lacy edge and those Castleware plates just make me wanna put my hands up and shout! Those are gorgeous! I love the shape and the texture. I'm sorry the other Princess House piece was broken. I can remember going to my first Princess House party when I was first married back in 1978. I still have the items I bought and use them often. Funny how some things just stick with you throughout the years even though others may deem them "outdated." I don't care. I love them! I hope you and yours enjoy a wonderful, warm and loving Valentine's Week! Love this table and the story behind it! So fun to have all of the mixed pieces, but great to see how they all work together. I'm so happy to have you at Seasonal Sundays and hope to see you more often. Kindly provide a link to Seasonal Sundays in your post. Beautiful table, love how you created your own plate! Rosie, you are too funny with the Hunt for Red October thing! This is so creative, and everything came together so nicely. Would never have known those were ladybug stickers! Love, love those chargers! Love the story behind your hunt, the photos, and the great theme. The layers and final table design is fabulous! Love the story of your hunt, the steps to creating such a clever design, and the final tablescape. Very clever and ever so much fun! Have a great Valentine's Day. Thank you, Laurie, for your encouraging comments. I appreciate the visit! The hunt was successful for your red and white table is lovely! 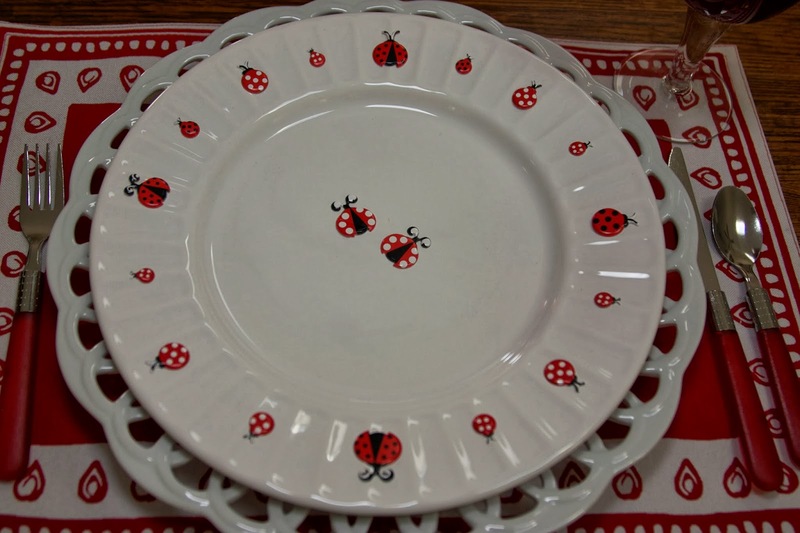 The ladybug plate is the cutest and thought it was a new pattern. I was on the hunt for some asian pheasant plates at Home Goods and discovered a tea set of red and white stripe china there. This began my tablescape for Valentine's Day! 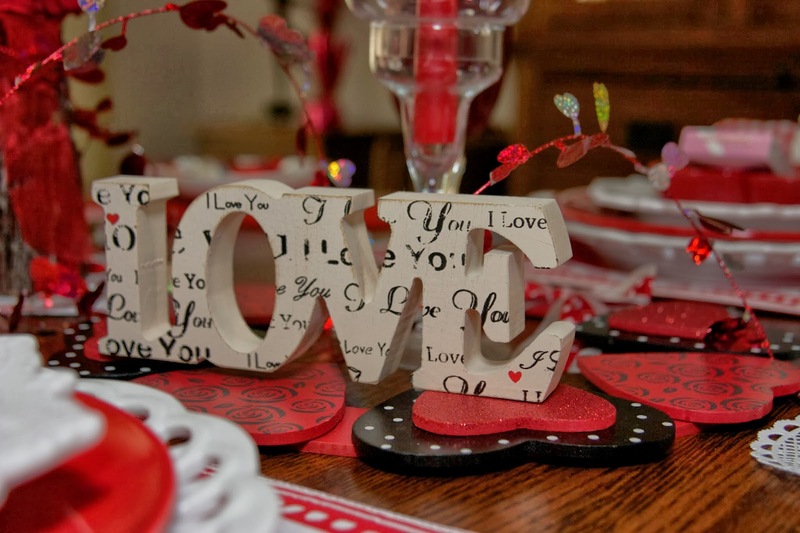 Your LOVE sign is a perfect addition to your tablescape. 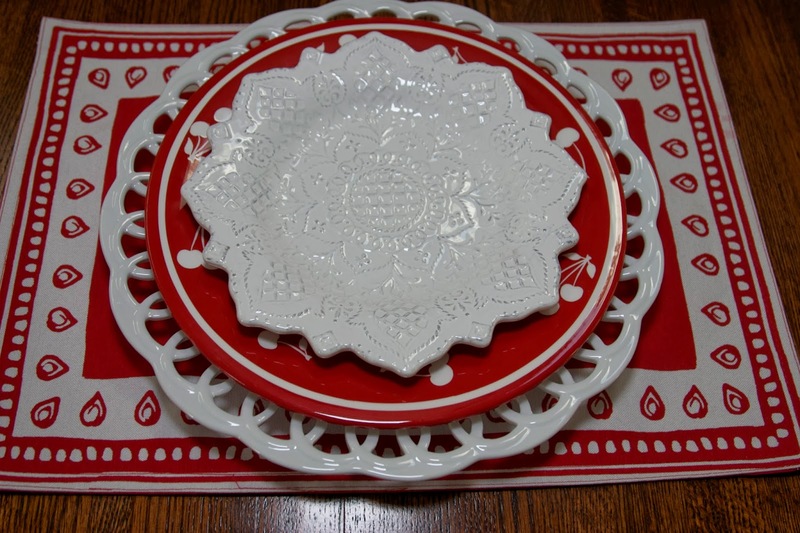 I hope you will take a peek at my post of red and white color table. have a wonderful 14th! Hi, Pam! I saw your post and drooled over you red and white striped tea set!! Hi Rosie. I think you ended up with a wonderful assortment of red plates. It looks very festive. Many thanks, Rhondi, for stopping by and taking the time to comment! Where do I start? with the knock-out dishes or the great idea of "Dish Decorating? LOL! What a fantastic idea! Love your chargers.....love the cherries and your napkin rings.....oh, just send me the table! 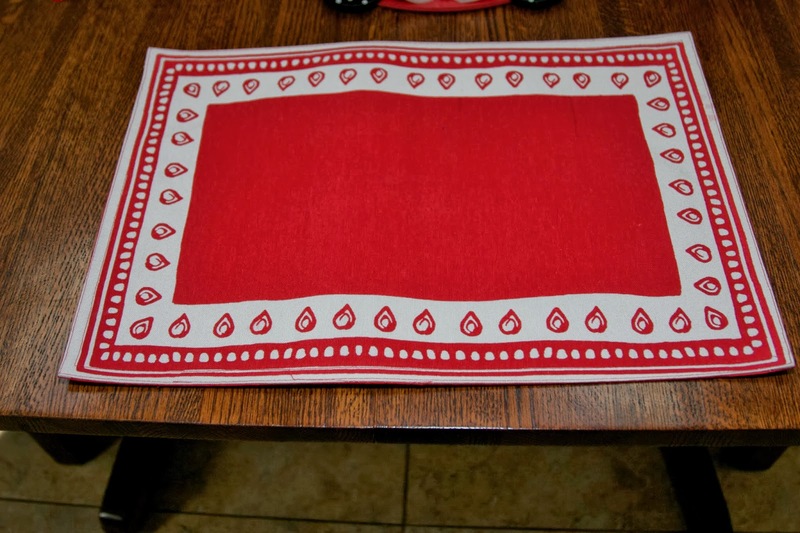 I am in the midst of making a set of napkins with poka dots and cherries on them! Found the fabric in Walmart of all places! will post them when I'm done...Have a wonderful Valentine's Day and know that someone in snowy PA is wishing for some of your sunshine! It all came together beautifully Rosie and omitting the cloth really highlighted your tablescape. You have a new followe! 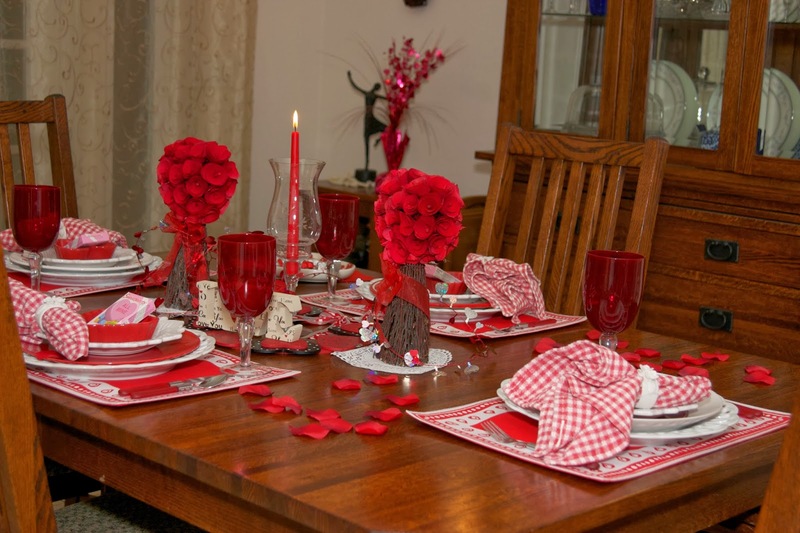 Your Valentine table is beautiful. I especially like the cherry plates. You should keep them out until February 22 and celebrate George's birthday...you know, the cherry tree legend. What a fun table! I was in love with your lady bug plate, what a find! You really did fool me! Isn't it always the case you can't find what you are looking for? Now you will find a dozen red themed plates. Your table is just adorable and I love all your little touches and finds. Those red ramekins from Michaels are just precious. Happy Valentine's Day! Thank you for all your kind comments. I appreciate the support. And you're right----I went to Home Goods yesterday and found a red plate! Go figure!! 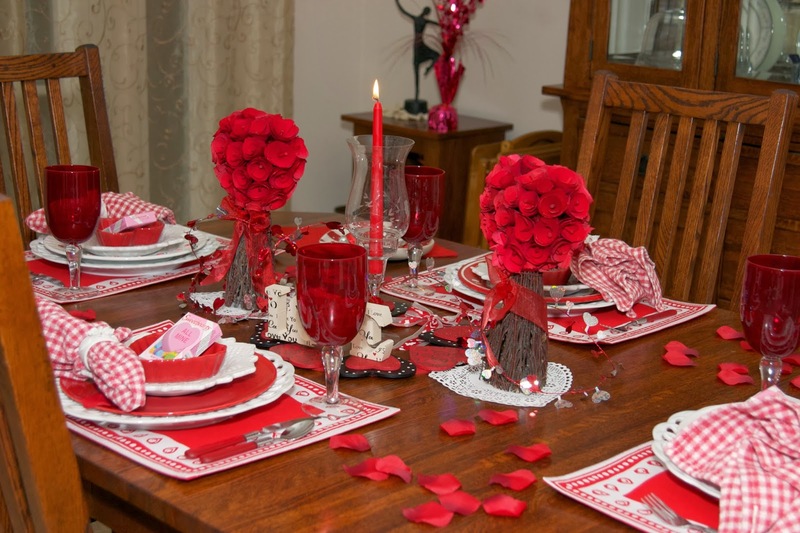 What a lovely Valentine's table...I have 4 of those cherry plates, 2 red/white and 2 white/red that are sitting in a pile ready to go to the thrift store! Wish you lived close enough that you could come get them! Have a wonderful weekend, Rosie. Oh my goodness, those are stickers on the ladybug one? I love that idea and wouldn't have thought of it. It's perfect for when you just flat out can't find what you want any other way. I have done the *Hunt for Red October* myself more times than I care to remember. It's frustrating. 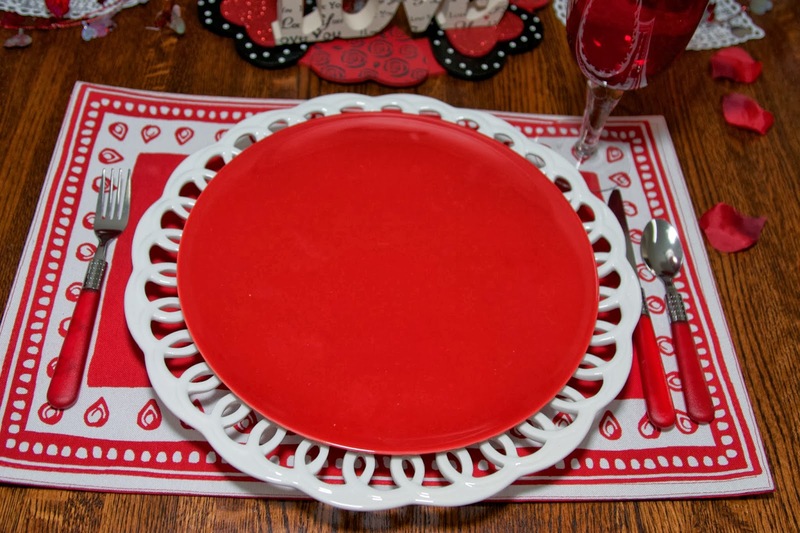 You, however, solved all allusive plate problems perfectly and put together a wonderful Valentine table. I love it. OMGoodness, this red and White tablescape is stunning with all and each plate been gorgeous! 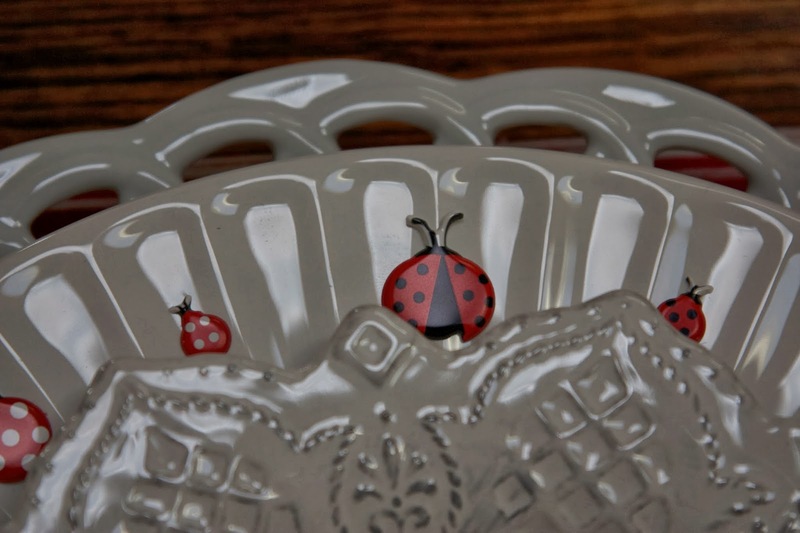 The ladybug plates are awesome and everything else! I'm in shock I haven't seen this!!! The placemats and the centerpiece bring this setting together beautifully! Thanks for your sweet and kind visit.